Here are some more super obscure denizens of the land of the little weirdos. 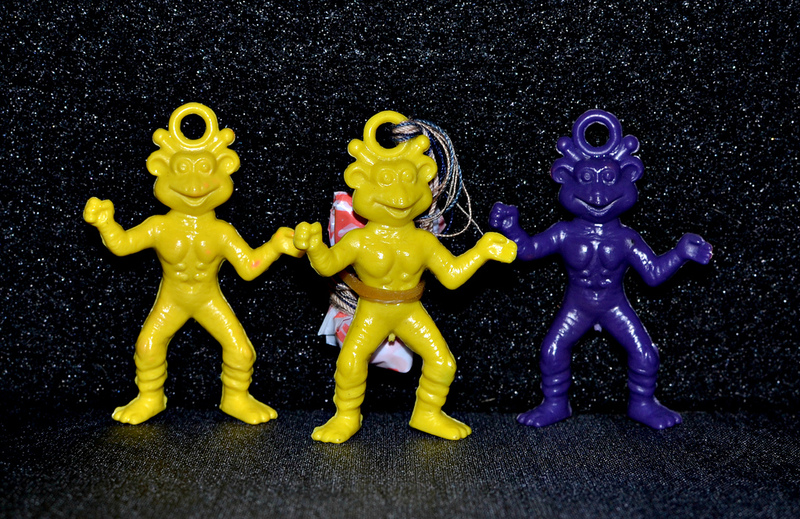 These guys show up in lots of mini figures occasionally, and people tend to have no clue what they are. In fact, I've seen more than a few collectors ask about their origins. I'm not sure if they were ever given a specific name, but what I do know is that they came out of vending machines. 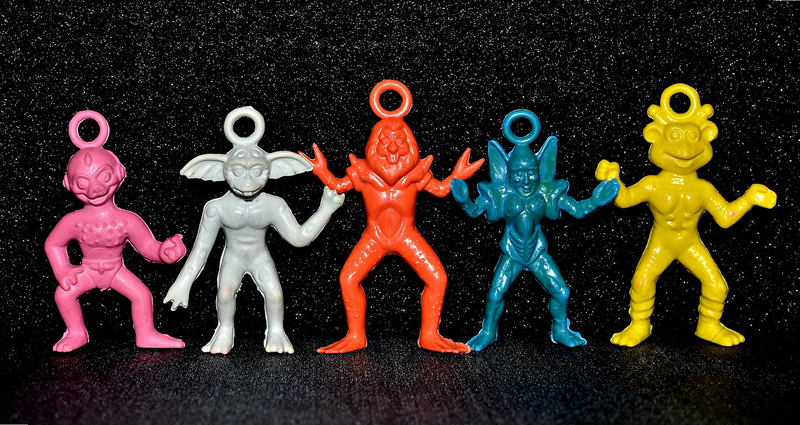 I got all of mine pictured here out of a single vending machine at a Phar-Mor around 1994-1995 (if only I was able to retain information about the important things in life as well as I can remember where and when I found little plastic monsters, ha...). I've also seen at least one person say they got some at an arcade. All of mine came with plastic parachutes attached so you could throw them up in the air and watch them float down. As a kid I always found the parachute thingies pretty useless and annoying, so I cut them off nearly all of my figures. With the loops above their heads that held the parachutes, you could also use them as charms. As far as I know, there were five different sculpts as pictured above. If anyone has seen any others, please let me know. 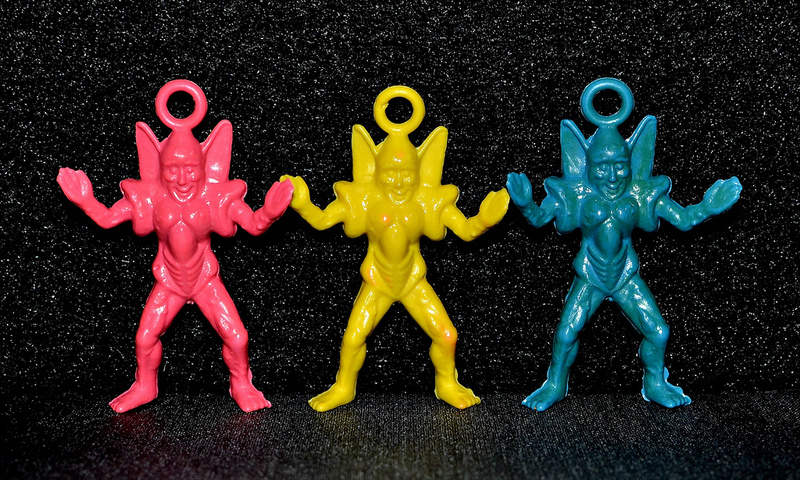 They are made of a couple different kinds of soft plastic (for some reason some are more rubbery than others), and I've seen them in many different colors, including: yellow, orange, dark purple, light purple, dark pink, light pink, blue, green, and white. Some of the designs of these are pretty wonderfully bizarre, like the bearded frog-crab guy in the middle and the vaguely female thing with gigantic ears and no neck. 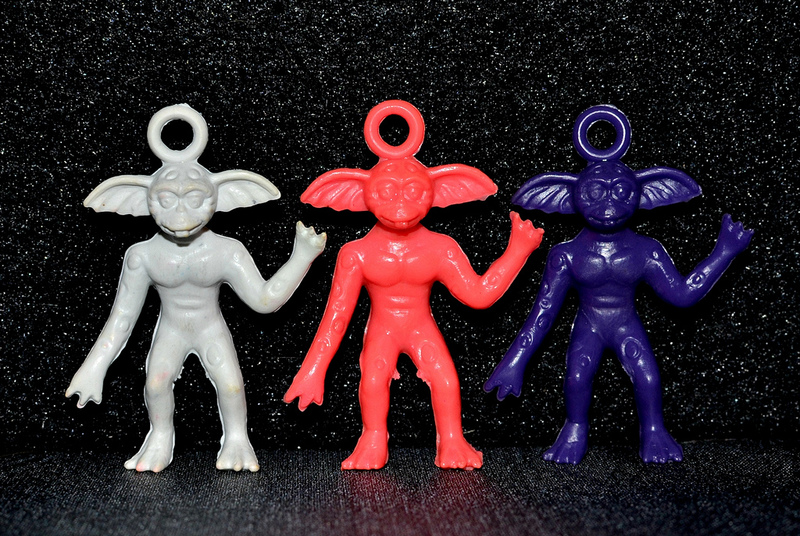 The alien pictured above in white seems to be at least somewhat based on Lenny from Gremlins. Below are some additional photos showing each of the sculpts closer up, including one with the parachute still attached. Do you have any of these figures? Do you remember ever seeing them out in the wild? I've seen them in lots ever now and then, never seen any kind of packaging to ID them, though. I, especially, love the pink guy in the last pic playing air guitar. Wish I could remember what the vending machine called them. The air guitar guy is one of the best for sure!